Three Poems By David Domine: "Snowflakes", "Hunting", "Daedalus in the Milking Barn, on a Winter’s Day"
David Dominé teaches at Indiana University Southeast in New Albany and his articles, stories, translations, and poetry have appeared in publications such as the Wisconsin Review, Golden Walkman Magazine, Danse Macabre, and Book Ends Review. His non-fiction books range in topic from folklore and architecture to bourbon, travel memoirs and regional cooking. Current projects include the forthcoming novel Peter Paul’s Kitchen and a true-crime book about the 2009 murder of Jamie Carroll and the subsequent trials of alleged killers Jeffery Mundt and Joseph Banis. They fell and fluttered into the failing blue. 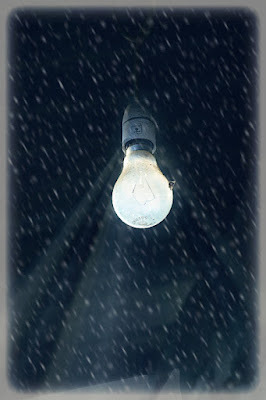 floated over the car in the gravel drive as a porch bulb flared at the neighbors’. Across the street, the yellow light in the church parking lot had been flickering since dusk. the frigid air fogging your breath. Mother flinched and tried to start the engine. But the freezing night had stilled it. the brandy hot on your words. you pointed the barrel and tears flooded the corners of your eyes. You lifted the gun and fired at the cloud again. as I held in my crying. But Paul, who wasn’t even four, began a flat wail. At the next little house, the side door scraped open. And Russ Flick came out onto the stoop, his flannel bathrobe open at the neck. Flushed with pink, the stiff linoleum floor of the kitchen reflected the sound. His fleshy wife followed and stood behind, shaking her head. till they shouted to put the gun away and go back to bed. Snow flittered across the windshield. Bits of frost flew by the flint gray metal barrel. as the wind flurried and a faint drift scattered like flour at their feet. I wondered why you were firing at the cloud. that you had made it snow. — First appeared as an audio version in Golden Walkman Magazine. boots crunch the brittle snow. My breath hangs heavy on the air. bear rifles on their shoulders. Gray metal sticks blend into the trees. and I hurry to keep up. Crick, crack, crick, crack, crick. and blends into the sky. It’s a thing real men do, it cries. It’s a thing real men do. beyond the birch and poplar. brushing the black of my boots. the sharp snap like a shot. and pray it does not cross our path. Head bowed as he hocks on the stool, his fingers tug and pull rhythmic streams into the silver bucket. The cow murmurs and her tail swishes as falling snowflakes curtain the open door. But his mind is not on the frozen barnyard outside. He doesn’t think of the pails of milk that need to be emptied into the silver cans that stand like amphora against the wooden wall. There is no need to worry about the beasts and their full udders. He dreams of the sea and hot sun. He remembers the day hubris took his son as if it was the day before and not more than a thousand years ago, when he worked with boards and chisels and nails and saws and hammers and a lathe inherited from his father. They were the tools of his trade. Today he needs only a low stool and his silver bucket. But he also uses a pitchfork every now and then, and the tall milk cans that the cheesemaker will empty into the big tank on his old truck. An empty pot of wax stands on a shelf over the milk cans. Although the brush has been cleaned and hangs from a rusty nail, dried wax still coats the inside of the pot, the rims. A clump of white feathers collects dust but he will not move it from its spot next to the pot of wax, will not shake off the motes, the layers that cannot dull his memory no matter how thick they become.